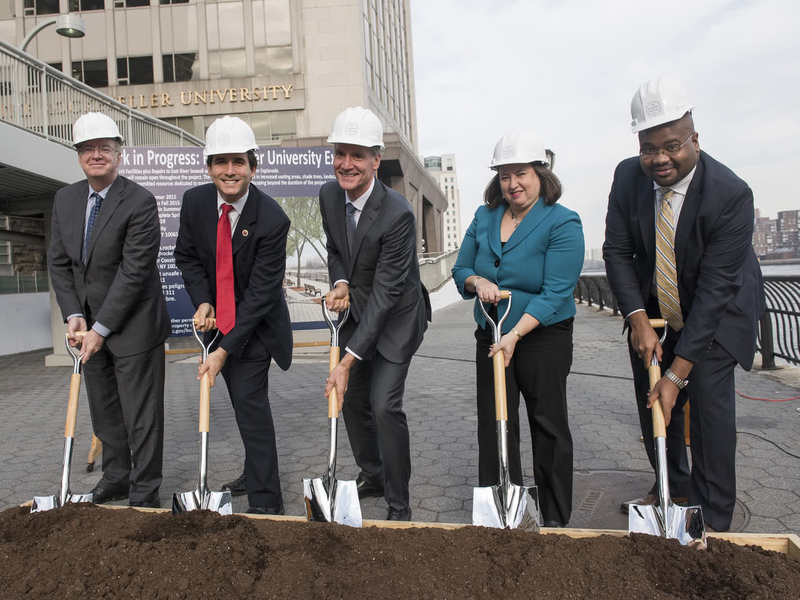 The Rockefeller University formally broke ground today on a project that will repair, and ultimately refurbish, a crumbling seawall and dilapidated stretch of public parkland along the East River. The groundbreaking ceremony, held on the East River Esplanade near 63rd Street, was attended by New York Chief of Staff Minna Elias on behalf of Congresswoman Carolyn B. Maloney, New York City Council Member Benjamin Kallos, Manhattan Parks Commissioner Bill Castro representing NYC Parks Commissioner Mitchell J. Silver, Deputy Borough President Matthew Washington on behalf of Manhattan Borough President Gale Brewer, and Rockefeller University president Marc Tessier-Lavigne. Initial work on the project will rehabilitate the seawall that supports the esplanade, spanning from midway between 63rd and 64th Street to 68th Street. The scope of the work includes repairing eroded joints between the blocks, replacing damaged, displaced, and missing blocks, and repairing eroded concrete. Refurbishment of the esplanade itself, to begin after the repair work, will improve landscaping, add new seating and lighting, create a designated bike line, and construct a noise barrier along the FDR Drive to reduce traffic sound. The university is spending approximately $8 million on the seawall repairs and esplanade improvements, and will also create a $1 million endowment to maintain the landscaping of this section of the esplanade in perpetuity. Breaking ground: (From left to right) Bill Castro, Benjamin Kallos, Marc Tessier-Lavigne, Minna Elias, and Matthew Washington celebrate as the project to repair the seawall near Rockefeller and to revitalize the East River Esplanade commences. These public improvements are part of a $400 million construction project that will add 160,000 square feet of modern, modular lab space to replace the research university’s aging facilities. It will also include a green, landscaped roof that will add two acres to the university’s existing 14-acre campus. The building, named the Marie-Josée and Henry R. Kravis Research Building, will be the centerpiece of the new Stavros Niarchos Foundation–David Rockefeller River Campus. Throughout the planning phases of the project, Rockefeller has worked in conjunction with its neighbors and local government officials, including Kallos, Brewer, Community Board 8, and representatives from the Parks Department in a collaborative process designed to ensure the public enhancements meet the needs of the community. The terms of the agreement for the partnership are memorialized in a letter the university sent to Kallos as part of the City Council’s approval of the expansion project. The university has also made a $150,000 gift to Friends of the East River Esplanade, a grass-roots conservancy dedicated to the restoration and renovation of the full length of the esplanade from 60th to 120th Streets. 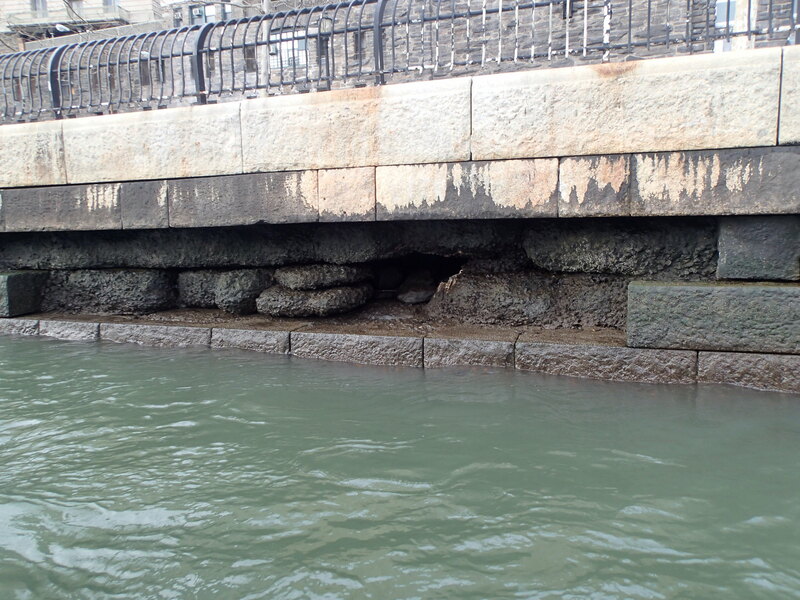 East River seawall: Damaged by hurricane Sandy in 2012, the East River’s seawall near Rockefeller will be repaired as part of the university’s campus extension project.